Kerala PSC online application process asks to add new declaration before applying for new notifications. So many candidates faced difficulty to register their application for University assistant, Computer assistant grade 2 etc. Many applicants are waiting for accurate direction to complete their application. Are you one among hem. So here is your helping platform. 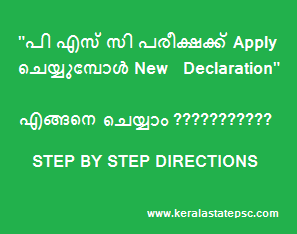 Go through he following steps to enter the new declaration before sending your application in PSC Kerala's website. Enter your User ID and Password to open your One time registration profile. Click on ' Profile' link on the Home page of your profile. You can see a link ' Declaration' at the bottom of the page. Click there. Your addition of new declaration process is over. All the very best.